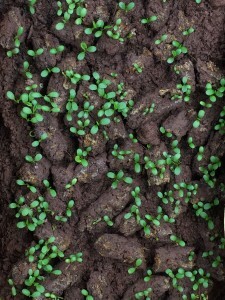 Clover cotyledons emerging from Guerrilla Droppings. A perfect way to plant for pollinators. A Guerrilla Dropping is a loosely formed pellet of compost, clay, and natural fibers that contains seeds and nutrition for growing plants. You can drop them discreetly on the ground and grow plants in under-used or neglected areas. They will degrade and enrich the soil as the seeds grow. Indeed. No one will want to disturb your plantings, including foraging animals! They are also very easy to plant, inexpensive, and have exceptional germination rates. The only poop in them is harmless worm castings, from our composting process. These are an effective and affordable alternative to seed balls. Seed balls, however adorable, require much more labor to produce and are therefore more costly than Guerrilla Droppings. Our standard package of Guerrilla Droppings (~0.5 kg) is equivalent to over 100 seed balls, while costing just a fraction. Sustainably harvested, non-GMO wildflower, native grass, and vegetable seed pellets. Contact us! Grow@GuerrillaDroppings.com. (814) 239-0078 We'd love to hear from you!